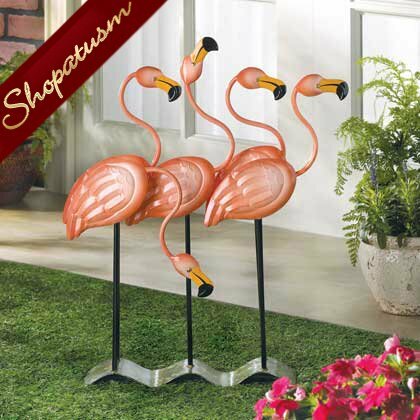 This is for a tropical flamingos garden decor, metal art statue from Shopatusm. Sunny tropics and sandy beaches spring to mind at the very sight of this fabulous flock of bright pink flamingos. Metal-art statue is a colorful confection that no discerning decorator will want to do without! Weight 3 lbs. Wrought iron. Some Assembly Required. 19 1/2 inch x 4 inch x 23 1/2 inch high.